Learning how to crochet roses is relatively easy, depending on the type of rose you decide to make. Many patterns and directions are available online and in crochet books. You can crochet rose buds, Irish roses, ruffled roses, floribunda roses, tea roses, and many other rose varieties. Techniques to crochet various styles of roses range from simple to fairly complex. Following the instructions to make a basic rose is quite straightforward. These roses can be made from very fine to quite bulky yarns; the finished size of the rose depends on the yarn size and the size of the crochet hook. Experiment with both yarn and hook sizes to get a variety of rose sizes and textures. Starting with a long chain, crochet a large scalloped pattern the length of the chain. Each row widens the strand of crocheted scallops so that the rose will be smaller at the stem end and wider where the petals spread out. The pattern can consist of one to a few rows of crochet, depending on the design. Leave a long tail of yarn for sewing the rose. The scallops will become the rose petals. When you've completed all the scallops, roll the string of crocheted scallops in a spiral, keeping the straight side down. When you have finished the spiral, use the long tail of yarn to sew petals together into a rose shape. You may wish to crochet and add leaf shapes. Sew a pin backing, safety pin, or Velcro to the back of the rose and attach it to various garments. You can also sew it directly onto a garment; however, if you do so, make sure the washing instructions for the garment and the yarn the rose is made of are the same. A variation on this type of rose is made similarly; however, by increasing crochet stitches instead of creating a scalloped pattern, you create a straight-edged, flared rose. An Irish rose is shown on this page. It is created by working multiple rounds. Colors may be changed with each round to give a variegated color rose. This type of rose requires intermediate crocheting skills, and you'll want to use a pattern to create an Irish rose. Use light to medium-weight yarn for Irish roses. Roses with separate petals can be time-consuming. You'll need to create rounds of varying sizes and fasten each round off, leaving a long tail for sewing. Rose buds can be made with just a few separate petals. Once you've completed the desired number of petals, you assemble the rose by starting with the smallest petals in the center. Roll the center petal into a tube with a slanted top so it resembles the center of a rose. Sew the tube closed at the bottom and add petals to the outside, sewing each one in place with one of the long tails of yarn. Weave ends of yarn into the bottom of the rose and trim. You can create other rose shapes with yarn and a crochet hook. Flat or open roses, similar to the Irish roses, can be crocheted from many yarn colors. You can also crochet tea roses, floribunda roses, and ruffled roses. Crocheted roses can be used to decorate a variety of household items and garments. You can sew crocheted roses to an afghan or bedspread. They can decorate a toaster or mixer cover. You can embellish placemats and coasters with flat roses. 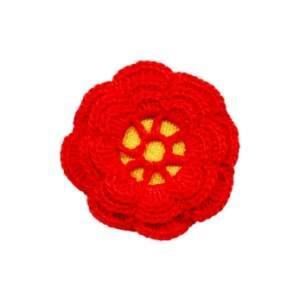 You can place a crocheted rose on almost any item on which a three-dimensional floral decoration is desired. Crocheted roses are also fun to add to crocheted hats, scarves, gloves or mittens, baby booties or shoes, sweaters, or other clothing. You can even add them to cloth or crocheted handbags. Little girls like crocheted roses on their winter hats and on hair ornaments. Only your imagination limits where you might use a crocheted rose for decoration. Just make sure to keep the scale of the rose appropriate for the size of the object to which it will be attached. Learn how to crochet roses, and you'll be able to quickly create lovely decorations for all sorts of things. Even picture frames and gift boxes can be decorated with crocheted roses. Because they are relatively small, most roses take only a short time to crochet. This makes them suitable as a last minute gift, such as a brooch, or to personalize a gift of a purchased scarf or hat. Your friends will be pleased with your crocheted gifts.